Heat 1 teaspoon of oil in a skillet or wok. Add the fish and ginger and cook, stirring very gently so that fish cooks evenly but does not come apart. When fish starts to turn white, remove from the pan. Precook the broccoli by placing it in a small amount of boiling water for a few minutes. Drain. 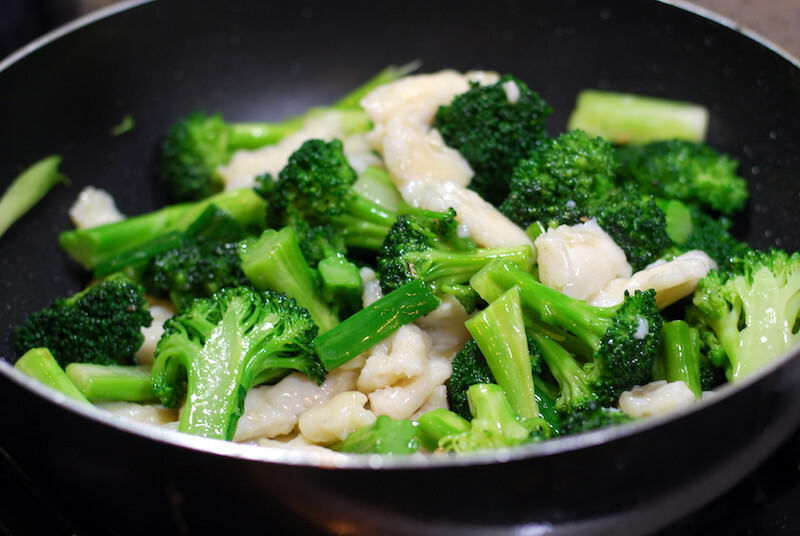 Heat the remaining teaspoon of oil in the skillet and add the broccoli, stir-frying 1–2 minutes until just crisp. Return fish to the pan, add the soy sauce, water, and cornstarch mixed together, and heat through so that sauce thickens and coats the fish and broccoli. At the last minute, sprinkle on the sesame oil. This is not necessary, but gives an interesting, Chinese taste.